13 kilometres from Capivari, this 8,300 hectares park has a simple mandate – to preserve and enrich the remnants of the once vast Atlantic Forest, the largestcontiguous tract of pine trees in Southeastern Brazil. Today, this is made up of three forests - Araucaria and Podocarpus, the Altitude Fields and the NebularForests. It’s the oldest state park in the region. The Zoom Adventure Company offers some treetop fun – climbing and zip-lining. For kids, there’s also a little train ride tucked away. From the Campos do Jordaotower, you’ll see some panoramic views. Check out the restaurant and the crafts shop. Free for kids under 12, adults over 60, and the disabled. How popular is Horto Florestal? People normally club together Parque Da Floresta Encantada and Museu Felicia Leirner while planning their visit to Horto Florestal. People also prefer to start their day with Horto Florestal. 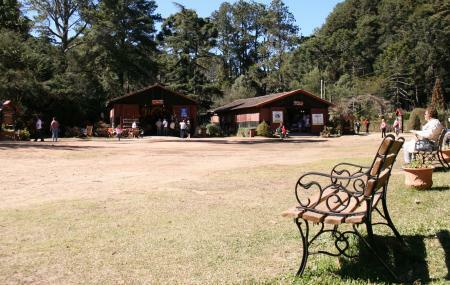 Beautiful region of Campos do Jordao. In the distant past I used to purchase there seedlings, to be planted in Umuarama - Campos do Jordao. I love this park, it's beautiful, the infrastructure is ok. There are a lot of things to do like hiking, ride a bike and some radical sports are also available (But you need to pay apart) . There are some small shop that you can get a coffee and some local food like pinhão cake ( it's a cake made of the Araucaria nuts). It's a nice place to bring your family and take good photographs too... it really worth to take a day to explore a little the local fauna & flora. Beautiful park with lots of outdoor activities. It has a few hiking paths, ranging from easy to difficult levels. One of them ends in a nice waterfall. Recommended!